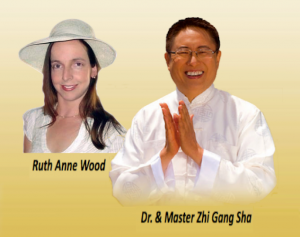 Ruth Anne Wood interviews #1 New York Times Best Selling Author Dr. & Master Zhi Gang Sha for her JV ATTRACTION and Live Your Peace community as Master Sha’s shares blessings for all souls and humanity in his latest book; Soul Healing Miracles. Visit DrSha.com daily at 12pm EST for live Soul Healing training with Dr. Sha. During this heart expanding conversation Master Sha shares Ancient and New Sacred Wisdom, Knowlege, and Practical Techniques for Healing the Spiritual, Mental, Emotional, and Physical Bodies. 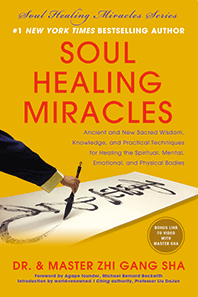 Dr. Zhi Gang Sha, better known as Master Sha, is the #1 New York Times bestselling author of numerous books, most famously his Soul Power series. He shows how we can use techniques such as chanting, calligraphy, singing, meditating, and specific body positions to unblock energy in our cells and organs to generate self-healing processes in our own body. Master Sha says we all have the power to heal ourselves. The body heals itself all the time. By learning how to move energy in our body using his techniques, we can facilitate that healing. It took many years for Master Sha to learn these healing process, but he is passionate about translating this knowledge into simple, straightforward techniques that anyone can use. Dr. Zhi Gang Sha is trained as a doctor of Western medicine in China, a doctor of traditional Chinese medicine (China and Canada), and a Grandmaster of Eastern arts, including tai chi, qigong, kung fu, feng shui, I Ching, and calligraphy. Master Sha combines the essence of Western medicine with Eastern healing arts and modern spirituality. The founder of the Institute of Soul Mind Body Medicine, he is the author of numerous bestsellers, including his most recent book, Soul Healing Miracles: Ancient and New Sacred Wisdom, Knowledge, and Practical Techniques for Healing the Spiritual, Mental, Emotional, and Physical Bodies (Ben Bella, 2013). For more resources visit Master Sha at: www.DrSha.com. Thank you for your Joint Venture request!